Former rock-star Antion Vikram Singh left Eric Burdon and the Animals nearly 30 years ago to pursue a spiritual practice that led him to study and then perform sacred Indian music in Sikh temples throughout the world. He was introduced, by chance, to Hawaiian music and has now succeeded in working it into his eclectic repertoire. And somewhere, is a vision that brings it all together in a sound as uniquely his own as the inner yearnings that guide him. Before he joined the Animals, the London-born guitarist played with entertainers like Rod Stewart and Dusty Springfield. Jimi Hendrix, who once named him as one of his three favorite musicians, alongside idols Eric Clapton and Jeff Beck. 1965/1966 Recorded with Rod Stewart, Long John Baldry, Julie Driscoll, Brian Auger in Steam Packet Review. 1966 Recorded with Johnny Halliday (the "French Elvis Presley") Album "La Generation Perdue", hit single "Noir c'est Noir" ("Black is Black"), both #1 in France. Danny McCulloch "Wings of a Man"
Sean (T.S. )Bonniwell (Ex Music Machine Lead Singer) "Close"
Hilton Valentine "It's all in your Head"
Zoot Money "Welcome to my Head"
Future "Down a Country Road"
Marc Eric "A Midsummer Day's Dream"
The Surf Symphony "Songs of Summer"
Recorded 6 New Age albums of Sikh Sacred music for Invincible Music under his Sikh Name "Vikram Singh Khalsa"
Victor Harvey Briggs III was born in Hampton, in West London. His father had been an American, Capt. Victor H. Briggs Jr., commander of C Company, 1st Infantry division. Highly respected by his men, Captain Briggs led them through the hell of Omaha beach on June 6th, 1944 where he was awarded the Distinguished Service Cross for gallantry. On November 17th 1944, he was killed in action in Northern France, before his only child was born. Young Vic was raised by his mother, the former Sheila Mills, who lived with her parents Alexander and Caroline Mills in Feltham, an undistinguished town about 15 miles from the heart of London's West End. As a child he was encouraged, like many children of the time, to take piano lessons. Although he did not continue for very long he gained a basic understanding of written music and a musical ear that would serve him well in his life to come. His mother was an avid fan of musicals and a sound track album of 'The King and I', 'Carousel' or 'Oklahoma' always on the record player. England was a grim place in the years following the Second World War and Vic, like many of his contemporaries, was always listening to the radio as a way to escape some of the gloom that surrounded peoples' lives in the early '50's. When he was ten years old Vic heard 'Rock Around the Clock' by Bill Haley and the Comets . It was thrillingly unlike anything he had ever heard before and he began to collect records by Bill Haley, Elvis Presley and Little Richard , the wild abandon of the music of the latter quickly made him Vic's favorite rock 'n' roll artist. At 12 years, Vic began to attend Hampton Grammar School . In spite of its very staid middle class traditions and rigid attitudes, and the fact that the headmaster and teaching staff were vehemently opposed to rock music and the culture that surrounded it, pupils from that school had a huge influence on the rock music scene in years to come. Amongst Vic's contemporaries at Hampton Grammar were Paul Samwell- Smith and Jim McCarty ( The Yardbirds ), Murray Head (movie actor and singer "One Night in Bangkok") and Brian May (Queen ). The skiffle craze was in full swing and for Christmas 1957, Vic's mother gave him a guitar. He quickly mastered a few chords and within months was playing with semipro bands. By the time he was sixteen he was playing two or three nights a week with a band called the Cruisers Rock Combo. One night in February of 1961, Big Jim Sullivan who was the lead guitarist with Marty Wilde (one of the early Brit teen idols) came to sit in with the Cruisers. Impressed with Vic's talent, Jim became his mentor; a role Jim also fulfilled for Ritchie Blackmore who lived only a few miles from Feltham. Big Jim was instrumental in getting Vic's first pro gig with a band called The Echoes. Although Vic only spent three weeks with the band (before his mother made him quit and go back to school) during that time he met many of the top names of Brit rock of that time including Cliff Richard and the Shadows and Billy Fury . "We were playing the Theater Royal in Chester. Ian Hines, The Echoes pianist, had been working in Hamburg a short time previously. He told us that there were some great bands from Liverpool that he had met there, the best of which was called The Beetles. We were quite unimpressed. "What a stupid name! Whoever would want to hear a band called The Beetles." "Liverpool is not far from here" said Ian. "I'm going to call my friends and see if I can get them over here". On the Wednesday night two characters showed up at the theater. They both had black leather jackets and hair piled up in pompadours on their heads. One was peroxide blond with a bit of stutter; the other had black hair and a ring on every finger. They had a slightly wild and out of control air to them. But they were very friendly. Ian introduced us. "This is Rory Storm, he has a band called The Hurricanes over there in Liverpool. This is Ringo, his drummer." And that's who it was, Ringo Starr in his days before the Beatles." Rory and Ringo invited The Echoes to come and jam at the famous Cavern Club in Liverpool. There Vic met Gerry and the Pacemakers and even The Beatles themselves, then still with Pete Best on drums. Vic's experience with The Echoes proved to him one thing- what he wanted in life, more than anything was to be a musician. Although Vic's mother forced him to go back to school, his heart was not there and his schoolwork fell by the wayside. He went back to playing semi pro bands. In April of 1962 he was invited to rejoin The Echoes for one gig to back up Jerry Lee Lewis who was making a comeback in the UK. It was an incredible experience actually playing guitar for one of his boyhood heroes. 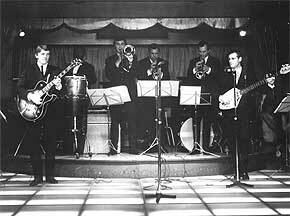 In the summer of 1962 Vic played for some months with a band called Peter Nelson and The Travelers. Although they were not a great band, they eventually morphed into Peter's Faces who came close to breaking into the charts in 1965. Two of the members, Peter Nelson and Robin Shaw, became the nucleus of 'The Flowerpot Men' who had a big hit in 1967 with 'Let's go to San Francisco", while today (2001) Robin Shaw and Tony Hall (also from The Travelers) are still touring with Cliff Bennet and the Rebel Rousers . During the time Vic was with them, the drummer broke his arm. 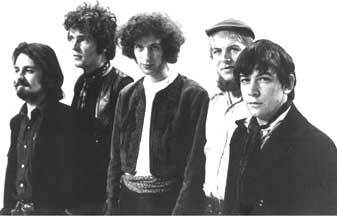 They brought in a substitute drummer called Mitch Mitchell , later to be one of the members of the Jimi Hendrix Experience. Mitch didn't play with The Travelers for very long but he was there for a band photo session, one of the photos from which is in his book: "With The Experience'. Around that time, Vic began to frequent a music store a short bus ride away in a town called Hanwell. The store was started by a drum teacher named Jim Marshall and was renowned for giving support and a fair deal to struggling musicians, as well as for having a great selection of gear. Shortly after that, Jim Marshall began Marshall Amplification , one of the most successful companies in Rock history. they went to Hamburg, Germany, where they had a residency at the Top Ten Club (The Beatles were just around the corner at the 'Star Club') At the end of the German tour, the band received an offer to go to Italy and Vic quit the band. The band stayed in Italy changed their name to The Rokes and became the top band in Italy throughout the '60's. Bassist Bob Posner's website tells the story of The Rokes. 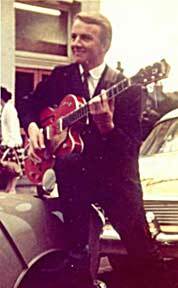 Between May of 1962 and February of 1965, Vic played with several different bands, including the Laurie Jay Combo, The Fleerekkers and Peter's Faces (Peter Nelson and The Travelers with a new name). He also went back to Germany for two months as a substitute with a band from Glasgow (John O'Hara and the Playboys), whose lead guitarist had been badly injured in an automobile accident. These were not great times. It was hard work playing uninspiring gigs, lots of traveling, long hours (in Germany, playing up to 8 hours a night!) with little success and even less money. But it was a time for paying dues. Vic used these years to refine a guitar technique that in 1967 would lead no less a figure than Jimi Hendrix to name him as one of his three favorite guitarists (along with Eric Clapton and Jeff Beck ). He also became immersed in the study of arranging and writing music. In January of 1965, success finally began to come his way. He was asked to rejoin The Echoes, the same band his mother had forced him to leave in September of 1961. 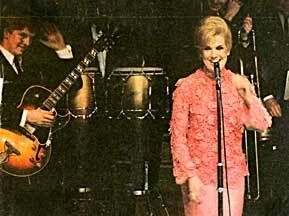 In the interim, The Echoes had become the back up band for hit making chanteuse, Dusty Springfield . On February 14th 1965 (his 20th birthday) Vic flew to Ireland to begin his first tour with Dusty. These were heady times to be involved in the British music scene. Vic began to frequent the 'in clubs' in London's West End where all the top bands, models, artists and other various assorted characters would hang out. Life was a constant party with nightly musical jams and parties until daylight being the norm. 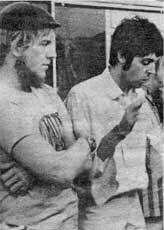 Vic became friendly with an outstanding keyboardist named Brian Auger . Brian had moved from the jazz world where he had been an award winning pianist to be part of the growing R & B scene which was THE happening place to be on the Brit music scene. Brian and Vic took an immediate liking to each other and became friends, spending endless time in the pre dawn hours at Brian's flat drinking gallons of tea and swapping music stories and Goon Show jokes. 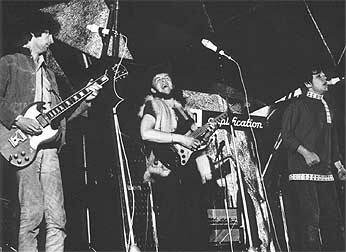 When Dusty wasn't working, Vic would go and sit in with Brian's band (The Trinity) featuring Rick Brown on bass and the legendary Mick Waller on drums. In August of 1965, Brian became one of the founding members of The Steampacket with Long John Baldry , Rod Stewart and Julie Driscoll. He asked Vic if he would join. The next year was a whirlwind of gigs (one week the Steampacket did 8 gigs! ), traveling and partying. The musical standards that Brian set were very high and Vic had to stay on his toes and keep practicing to stay with the program. Slowly the Steampacket began to disintegrate. Rod Stewart left in March of 1966. After the band spent the month of June in a club in San Tropez in the South of France, Long John left. It then became Julie Driscoll and Brian Auger and the Trinity. During that summer, Brian and Vic recorded an album with Johnny Halliday , the top French male singer. One of the songs 'Noir c'est Noir' ('Black is Black') went to the top of the French charts. In May, something happened that, while it seemed unimportant at the time, would play a major role in changing Vic' destiny. The craze for Indian Classical music had just begun and people were interested in Indian musicians like Ravi Shankar . While visiting with Eric Clapton at his home, Vic asked him if he knew anything about Indian music. Eric immediately pulled out two albums and gave them to Vic to borrow. "The albums were of vocal music in the Dhrupad style by the Dagar Brothers and of bansuri (flute) music by Panalal Ghosh. My mind was blown; this was a dimension of music I had never imagined. After I listened to them once, I went to an Indian import store, bought them both and gave Eric his albums back. I still have those albums in my collection." Thus began a fascination for Indian Classical music that would take his life on an incredible journey. On September 28th, 1966 Brian and the Trinity were playing at the Scotch of St James. Chas Chandler came in with a very unusual looking black guy with wild hair. Asking if he could sit in with the band, he borrowed Vic's amplifier and proceeded to wow the crowd. "At that time I was playing an unusual Marshall stack that they had developed. It had twelve six-inch speakers with a hundred watt amplifier. Jimi plugged in his Strat (which was right handed but strung left handed) and turned every control on the amp up to eleven! I was horrified. For one thing I was sure this would blow out the speakers, I had never turned the volume up past five. And for another, The Scotch of St. James was about twice the size of the average living room. What was this guy trying to do? He must have seen the look of horror on my face because he immediately said to me "Don't worry man, I turn it down on the guitar". This was Jimi Hendrix. He and Vic became friends that evening, partly based on their mutual admiration for each other's playing. On October 18th, the band was at L'Olympia, the top music hall in France at the time for a show with Johnny Hallyday. The Jimi Hendrix Experience had also been added to the bill. Shortly before the show, Vic was approached by Mike Jeffrey, who was Jimi's co-manager (with Chas Chandler). 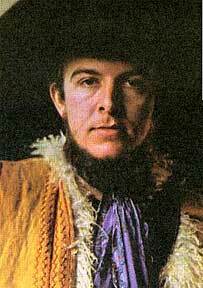 Mike was also the manager for Eric Burdon and The Animals and he asked Vic if he would like to join The Animals. Vic immediately agreed. After giving notice to Brian, Vic joined The Animals in November of 1966. 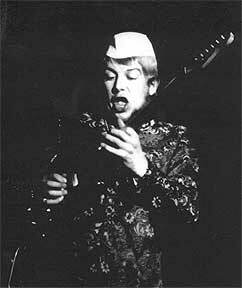 The other members were Eric Burdon (vocals), Barry Jenkins (drums), John Weider (guitar) and Danny McCulloch (bass). John had played with Vic in the Laurie Jay Combo in 1963 and regarded Vic as somewhat of an older brother. Their friendship is still very much alive. After some weeks of rehearsal, The New Animals (that is, the version with Vic in it) made their debut on December 2nd 1966 at the University of Birmingham. The band also began recording, making their first single "When I was Young" at Olympic studios, also in December. In January, Mike Jeffrey cut a deal for Eric to sing a song in the upcoming James Bond spoof "Casino Royale". The song was a Bacharach/David song. "I was to arrange it. I went up to see Burt Bacharach at his hotel in the West End. Even though it was the middle of winter Burt looked tanned and handsome, having just come from LA. I wrote some horn parts and we recorded the song. Everyone was there. Tom Wilson (The Animals producer), Mike Jeffrey, Burt and Angie Dickinson and Burt's song writing partner, the great lyricist Hal David . Everyone was very happy with the track and congratulated me. I was quite pleased with myself. It was the first time that a written arrangement of mine had been recorded." However, when it came time for Eric to overdub the vocal, he hadn't learned the song properly and Hal David vetoed its use in the movie. After a few weeks of doing gigs around the UK and Europe, it was time for the experience of a lifetime: a tour that would take the band around the world with concerts in the USA, Canada, Australia and New Zealand. They left for New York on February 2nd 1967. The tour was hard going at first, slogging through the cold and dealing with unappreciative audiences in New England, Canada and the Midwest. But, when the band arrived in California, there was an immediate feeling of relief, a sense of 'coming home'. There in Los Angeles, the band recorded their first album. 'Winds of Change". The hit "San Francisco Nights" (with Vic playing lead guitar) was taken from this album. Indian music had become very popular on the West Coast and Vic was able to buy some great albums including some by India's top Sarod player Ali Akbar Khan who had taken up residence near San Francisco. On their visit to San Francisco, the Animals played an unscheduled gig at the Avalon Ballroom in San Francisco where they met the Grateful Dead . Vic became friends that night with Bill Kreutzman who today only lives ten minutes drive away on the island of Kauai. After touring Australia and New Zealand, the Animals returned to the UK in May where the 'Summer of Love' was just beginning. The Animals at the premiere of the movie "Stranger in the House". Vic wrote and produced the song "Ain't That So" which was featured in the movie. Eric was smart enough to stay home! Eric found out that the Monterey Pop Festival was going to take place and had Mike Jeffrey move heaven and earth to get The Animals on the festival. And so the band flew back to LA on June 15th, appearing on Friday June 16th at the festival. On that trip, the Animals also played two legendary California venues for the first time: The Fillmore Ballroom in San Francisco and the Whiskey a gogo in Hollywood. After spending August and September back in London, the Animals were back in California in October. Here they recorded their second album, "The Twain shall Meet". By now Vic's arranging skills were growing in leaps and bounds and are quite evident on this album where he wrote for strings, horns and even the band of the Scots Guards. This album produced two hit singles: "Monterey" (again with Vic playing blistering lead on a Danelectro electric sitar) and "Sky Pilot". December found the Animals back home in London. Except that it didn't feel like home anymore. The "Summer of Love" had come and gone. The Brits had very little interest in psychedelic music and many felt the Animals suspect because of their oft expressed attraction for California. It was also becoming obvious that there was gross financial impropriety in the Animals management. In January 1968, the band returned to LA, this time to stay. But something had changed. The Summer of Love had gone from California as well. After the idealism of 1967, 1968 was to be a year that would bring increasingly hostile demonstrations against the Vietnam War, as well as the assassinations of Martin Luther King and Robert Kennedy. Friction started between the band members and it soon became obvious that the writing was on the wall. Eric brought Zoot Money into the band, but Zoot's presence, lovable guy and great musician that he is, only hastened the bands demise. After recording the New Animals third album (Everyone of Us) Vic and Danny McCulloch left the band in July of 1968. For a long time, Vic had wanted to try his hand as an independent arranger and producer. His work with The Animals had already given him a reputation amongst the musicians of LA and so he began to work as a producer as well as an independent arranger for other producers. His first album project as a producer was with Danny McCulloch for Danny's album 'Wings of a Man'. During the late '60's, the LA recording scene was THE place to be. An enormous string of hits had been produced by such artists as The Beach Boys, The Byrds, Sonny and Cher, The Monkees and many others. At the heart of most of these recordings was an elite group of musicians known as the Wrecking Crew. Although it was an ever changing group, some of these musicians became famous in their own right; musicians like Hal Blaine , Carol Kaye , Michel Rubini and many others. Jim Gordon ­ drums, Lyle Ritz ­ bass, Michel (Mike) Rubini ­ piano, David Cohen ­ guitar, Gary Coleman ­ percussion. Since these musicians were in demand and not always available, Vic also used Hal Blaine, John Guerin - drums, Carol Kaye ­ bass, Alan and Gene Estes ­percussion, Al Casey, Mike Deasy, Don Peake ­guitars. From the wealth of fine horn players in Hollywood, Vic would often use Plas Johnson and Gene Cipriano on reeds, Vince DeRosa, Bill Hinshaw, Art Maebe and Henry Sigismonti on French Horns. 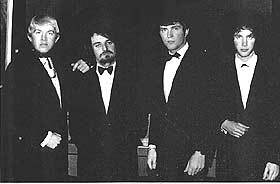 And of course Vic's long suffering copyist, Virgil Evans on trumpet, as well as Tony Terran who was featured on "Hotel Hell", a cut from the Animals' "Winds of Change" album. Vic's concert master for the string section was inevitably the unflappable Jimmy Getzoff, concertmaster for the Glendale Symphony. "It was quite incredible. Here I was in LA working with jazz guys that I had idolized for years. I was in demand and just having a great time. I cannot express what an honor and privilege it was for me to play with these great musicians at such an exciting time." He was arranger for projects by singer songwriter Marc Eric ("Midsummer Day's Dream"), and country rock band Future. "None of these albums made it commercially but, through the internet, I've come to find out that some of them are now underground favorites and collectors' items. The Mark Eric album goes for $100 if you can find it, while Sean Bonniwell's album goes for $150. The other gratifying thing is that I get e-mails from young people telling me how much they enjoy my arrangements on these different projects." Although Vic was fulfilling his dream of being an arranger and producer, something was gnawing at him. He had developed a great love for Indian music and but was ignoring that side of himself. He knew that instinctively that his spiritual development was being ignored. "I think it was sometime during the fall of 1969 that I realized that music and spirituality for me were one and the same. I knew that I only wanted to play and write music that was spiritual in nature." Also, Vic was still involved contractually with the Animals management. Danny McCulloch had signed with Wally "Famous" Amos , who was in artist's management at that time. Wally was interested in managing Vic but the deal never materialized. Vic took a job as a staff producer with Capitol Records in May of 1969. He quickly found that he was not suited to the stifling corporate life but felt he needed the security of a steady income. He began to suffer from depression. After the Animals management pulled some dirty tricks on him in November of that year, he began to wonder if he was cut out for the business side of the music business. On December 16th 1969, he got his answer when he was fired from Capitol. Vic Briggs, rock guitarist, arranger, producer and party animal was about to undergo a transformation. For a great read and background on the British Blues scene of the early '60's, go to Confessions of a Sixties Drummer Carlo Little's outstanding website. Carlo was a major influence on many later-to-be-famous drummers and his site gives an authentic feel of the tumultuous London music scene in the early '60's. Another writer's version of the "Vic Briggs Story" . "On the way home after I had been fired, I was devastated. How was I going to maintain my lifestyle without my salary from Capitol Records? And yet, after reaching home, I began to feel an enormous sense of relief. No longer would I have to go and work in this awful, constricting corporation. That week the LA Free Press carried an interview with Richard Alpert. He had been one of the notorious LSD researchers at Harvard with Timothy Leary and had co-authored "The Psychedelic Experience. But in the intervening years he had gone to India, met a Guru and become Baba Ram Das , the first American spiritual teacher of the Psychedelic Age. He was giving a lecture that Friday at Beverly Hills High School. "I was fascinated by his story. I also was hungry to hear anyone who had direct experience of Indian mysticism. So I went. On January 22nd, 1970 Vic saw an ad for a yoga class in the Melrose cRobertson area of LA. It was that night that he met Yogi Bhajan , who was to be his spiritual teacher for the next twenty years. 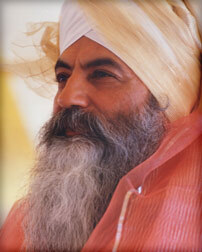 "Yogi Bhajan was an imposing man, more than 6 ft 4 ins in height who carried himself like he was king of all he surveyed. I was quite overwhelmed with his personal aura that was extremely powerful. "When you sing, he said, " people will come for thousands of miles to hear you. The dead will rise from their graves when you sing. My first thought was that Yogi Bhajan did not speak English well and that he had no idea what a Sarod was. But I didn't have too much time to think about it because he literally zapped me with energy from across the room, causing my third eye to open and for me to go into samadhi for a few moments. At that point, I allowed him to become the spiritual and temporal father that I never had.. The great saint Guru Nanak, born in India in 1469, founded the Sikh way of life . It is a simple, spiritual way of life that involves meditation, working righteously and sharing with others. After Guru Nanak, there came nine more human gurus who worked to expound the teachings of Guru Nanak and solidify the Sikhs into a community. Starting at first as an almost pacifist community they were forced by Mogul persecution to take up arms.The last human guru, Guru Gobind Singh (who died in 1704) gave the Sikhs the distinctive identity ofuncut hair and turbans. realized that something had to give. Vikram would not have anything more to do with the entertainment business, while Kirsten did not want to leave her rich and famous lifestyle. In 1979, he went to India. Singing in Gurdwaras all over the North of India, he was invited to sing in the most revered Sikh shrine, the Golden Temple of Amritsar, becoming the first non Indian to do so. In 1980 he repeated this pleasurable task. The Golden Temple is a stunning place. Its construction was begun by Guru Ram Das the fourth guru of the Sikhs, but was completed by his son, Guru Arjun an outstanding poet and musician who complied the Sikh Scriptures, known as Siri Guru Granth Sahib. It is said that Guru Arjun gave the architect of the Golden Temple a vision of Paradise so he could be inspired to create Heaven on Earth. The Temple itself is set in the middle of a huge artificial tank which was dug by hand. Pilgrims have to cross a bridge to reach it. The temple itself is quite small. But the tank and the surrounding complex reflect its radiance, as well as the sacred music sung therein. The music starts at 3 am and continues to 10 pm. It is broadcast around the complex on a PA system and is absolutely mesmerizing and intoxicating in its beauty, fervor and devotion. The temple itself is constructed of marble but the upper walls and the five domes are covered with sheets of copper, which themselves are covered with beaten 24 carat pure gold. The reflection of the bright Indian sunlight off the golden walls and domes is dazzling. It is a place that is solely dedicated to the praise and service of God as well as to those come to serve Him and seek His blessing.